CONROE – For the second time in two years, the Crockett Bulldogs faced off against the La Marque Cougars in the Area Round of the UIL Basketball Playoffs. Last year, the two teams met in the Woodlands with the Cougars winning by a score of 72-50. This year, the two teams headed north on I-45 to meet in Conroe. Unfortunately, the result was the same as Crockett fell to La Marque by a final of 58-38. The game started with the two teams playing to a stalemate in the first quarter as La Marque led by one, 11-10, after the first eight minutes of play. The Bulldogs’ points came from both the inside and the outside. Marcus Shedd knocked down two from behind the arc for six points while Allen Horace powered his way inside for four. The Cougars were led by Edward Robinson with four points and Jeremy Avrie with three. Joining them in the scoring column were Ray McChristian and Kordell Stewart with two apiece. The second quarter saw the Cougars begin to pull away only to have the Bulldogs track them down and cut a 10 point lead down to seven at the break. Horace continued his dominant play inside with six while Christian Brice had four and AJ Owens added two which made the halftime score 29-22. La Marque’s Jordan Ivy took control of the game with 13 second quarter points. Anthony Williams added three and Robinson dropped in another two as the Cougars led by seven at the end of the first half. It appeared as if the Bulldogs left their shooting touch in the locker room when they came out after intermission. Crockett only managed seven points in the third quarter while the Cougars opened up a 45-29 lead by the end of the period. Draylin Bryant, Horace and Derrick Sherman all had two for Crockett while Shedd converted one of two from the line to close out the Crockett scoring in the third quarter. 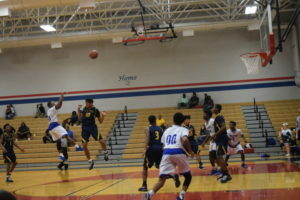 Meanwhile, Robinson scored six for La Marque and was joined in the scoring column by Stewart as well as Willie Johns with four apiece while Ivy also added two. Down by 16 with eight minutes left in the contest, Crockett tried to make a comeback but it was simply not meant to be as La Marque held on to win by a final score of 58-38. The Bulldogs fourth quarter pints came from Toreyan Jones with five while both Brice and Horace had two apiece. 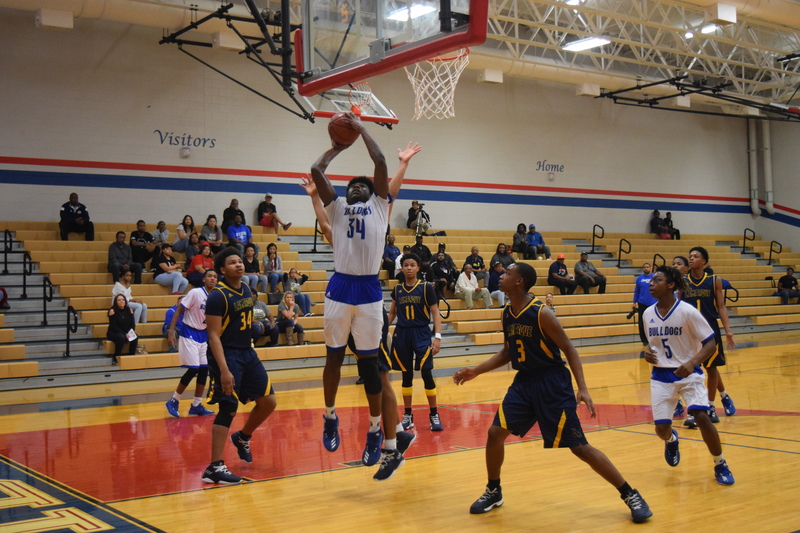 La Marque had five players in the fourth quarter – Rha’sean Booker, Ivy, Johns, Robinson and Williams – who all scored two, while Justin Murray, Jr. nailed a three to help give the Cougars the 20-point victory. For the game, the Cougars were led in scoring by Jordan Ivy with 17 points and Edward Robinson with 14. Both Willie Johns and Kordell Stewart had six while Anthony Williams had five. Jeremy Arvie and Justin Murray, Jr. added three apiece while Rha’Sean Booker and Ray McChristian had two. The Bulldogs were led in scoring by Allen Horace with 14 points. Marcus Shedd had seven, Christian Brice had six and Toreyan Jones had five. Other players in the scoring column for Crockett included Draylin Bryant, AJ Owens and Derrick Sherman – all with two.